Just recently, bond investor PIMCO published the chart shown above. It’s one of many charts hitting headlines in recent weeks, revealing that the end of an era of unprecedented monetary stimulus is finally upon us. 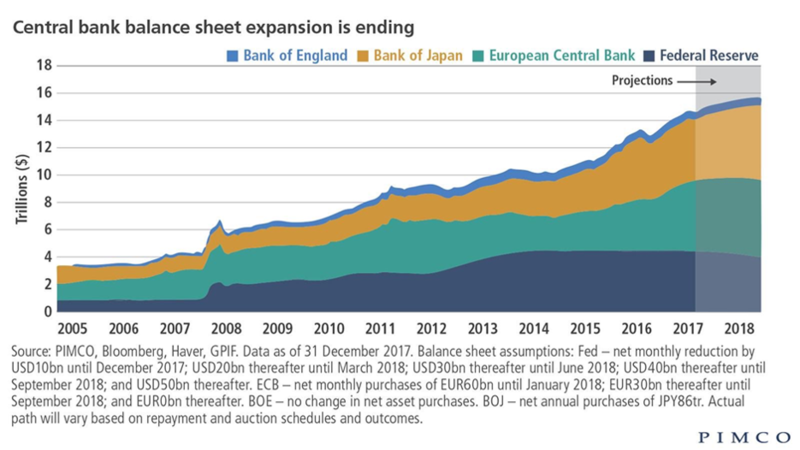 With the Federal Reserve already hiking rates and reducing its balance sheet, other central banks are likely to follow somewhere in the foreseeable future. But how will markets cope with the ‘void’ that is left behind? For bond markets I’m inclined to say, ‘not that good’. Given the current economic outlook, it’s difficult to picture a scenario where bond yields are not going up. 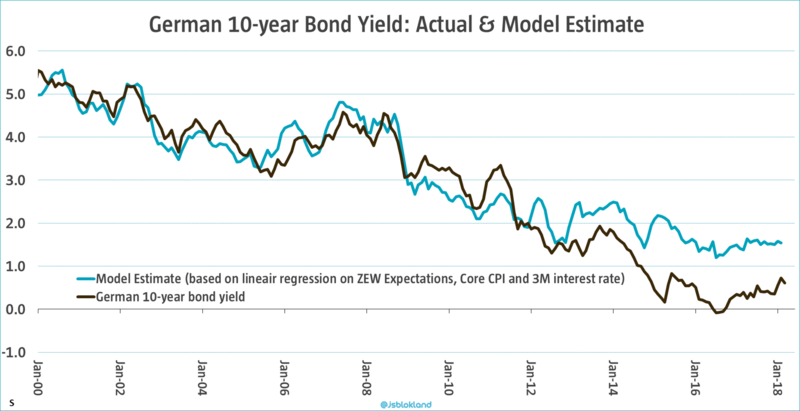 Especially in the Eurozone and Japan, where QE is still ongoing, bond yields remain artificially depressed. 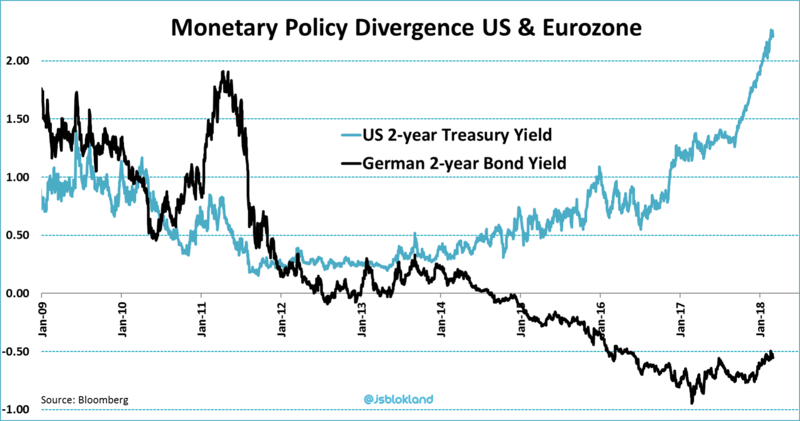 This week, the difference between the 2-year government bond yield in the US and Germany grew to a massive 2.80%. We have to go back to the previous millennium to find a bigger gap. Stripping out the ECB-stimulus effect suggests a German 10 -year bond yield somewhere close to 1.50%, more than double the current rate. And, even though rates have normalized to some extent in the US, yields remain low here too. It would probably take a severe downturn in economic conditions for bonds to provide a decent return. So what about equities? My guess is that stock markets need to get accustomed to the absence of central banks too. However, for equities a strong economy resulting in strong company performance can counter this effect. Last quarter, sales growth of S&P 500 companies was the strongest since 2011 and earnings are up more than 20% on an annual basis. Companies in other regions are doing well too, if not better. The stellar rise in company earnings also benefits valuations, which have increased significantly in recent years, especially in the US. Finally, stock markets tend to do well when inflation rises from low levels. Yet, equity markets are not without risk. It has been well over a decade since we have seen a synchronized global monetary tightening cycle. The way things stand now, we will likely see exactly such a cycle starting in 2019. With the abundance of liquidity undoubtedly impacting stock markets, equities too face a formidable challenge dealing with the withdrawal of central bank stimulus. Hence, expect periods of ‘adjustment’ going forward. ← The Average Return doesn’t exist.